I have a group of crafty ladies I meet up with about 3 times a month. Often times I will take over some Altenew flower stamps and just stamp a bunch and make them into cards later on. I stamped and then fussy cut quite a pile of blue primroses. I had enough to make 4 cards. Two of the designs are below. I made a few variations of each card for this year's batch that was mailed. I hope you are all enjoying a day of happiness with your loved ones. Today I have an entry that is clean and simple for The Card Concept. 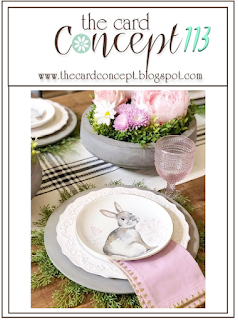 I was inspired by that bunny on a clean white plate with just a few muted design bits on the plate along with the bunny. The greenery and the daisy also made it to my card in a fashion. I used various colors of Arteza brush pens to color the flowers- I used lots of water to make the colors much softer versions than straight from the brush pen. To finish it off I die cut the panel with a and added a pale pink card base. I couldn't resist making this card. As soon as I saw this sweet cat image in the Gerda Steiner Playful Kitten set, I was itching to make a card. I had a cat who loved hopping onto my suitcase while Hubs and I were dating. He looks all black, but hes not. His underside had 3 white patches...as if he was wearing a bikini. I miss him, he was the sweetest little guy who just showed up at the front door meowing one evening. He came in the house and claimed it as his new space. Another post where I have cut a bunch of flowers, this time from MFT's Stitch Blooms and made flowers. I used two tones of color for each flower and added a coordinating card base. A thank you card for my Dad. Of course there is a cat involved. There are times when I don't know what I want to create but I need to do something. This time I stamped a bunch of flowers using Altenew's Stunning Cosmos stamp set. I used their inks as well. After having stamped them all out, I added some more depth with copic markers, and then fussy cut a whole bunch of them. I have the dies, but with that many flowers its just easier to fussy cut since the shape is not super intricate. Here is my pile of blooms, you can see one of the pink flowers without the copic color addition. I was able to make several cards with this bunch of blooms. 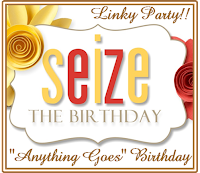 I am combining two challenges today - Seize the Birthday - Spring, and Color Throwdown Purple, Green, Yellow and Gray. I started by creating a watercolor background with all 4 colors. Over that I stamped some crocus flowers from Pretty Pink Posh in light gray and added watercolor in another no-line coloring attempt. Once finished the panel was mounted on a pale green cardbase. I love purple and green together. I need to get this in quick as time got away from me. 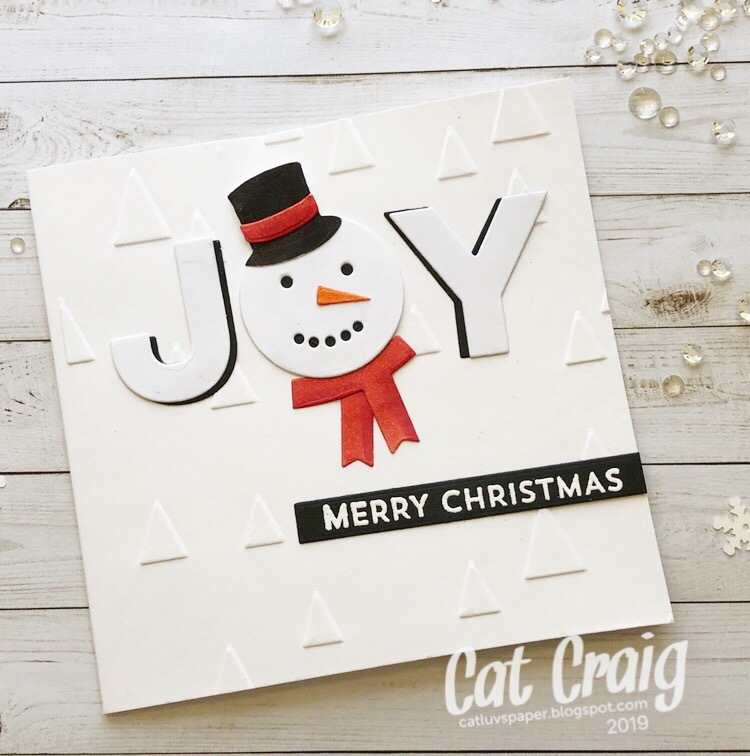 The challenge over at Christmas Kickstart is die cuts. I used the MFT dies from a card kit last year. 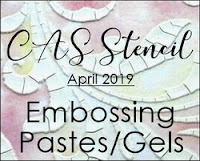 The embossing folder is from Stampin Up. I'm playing along with a couple of challenges. I took out the watercolors. I haven't played with them in a very long time. 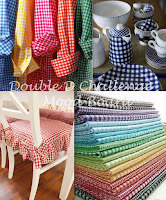 The challenges are CAS Watercolor Challenge, Die Cut Diva's and Double D Challenges. 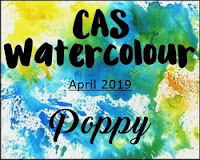 I created a backdrop by splotching around some yellow, umber and green watercolors. Once that was dry, I stamped in very light ink a portion of an IO poppies stamp. I have about 1/3 of the stamp on my panel. I went for a no-line watercolor look. After adding several layers of color and allowing it all to dry, I added a sentiment from CTMH. I die cut the panel, and mounted it on a pale green card base. I've got another card for a couple of challenges. I kept the water colors out and added the jar of embossing paste to my supplies. 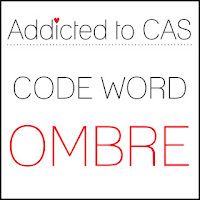 This card will be entered to CAS Stencil Challenge and Addicted to CAS Ombre. And its a stretch, as mine is a mirror image of the sketch at Case this Sketch. I began with a piece of taped down watercolor paper. I wet the panel in a small elongated triangle. I added lots of watercolor at the bottom and drew it up the panel. I used some water to take out some pigment at the top of the color, dried it and added another layer of color at the bottom. Once that dried, I added some embossing paste through the SSS leaf stencil. I topped that off with a silver embossed flower on vellum from Altenew. A small sentiment in sliver on black balances the bright pink. I needed to make a thank you card for Hubs. 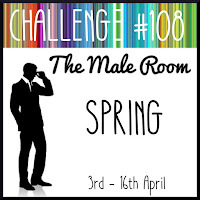 It fits well over at the Male Room Challenge, which is spring. Its a few days late, but I finally got my April calendar page completed. I had to used the sweet lil Newton's Nook bunnies. Just some quick coloring and adding the month. My card for the March Card Chain Challenge is going to Jeanne in Minnesota. I went with several of the options this month. I used the colors Charcoal, Lime and Daffodil; along with the technique of stamping, and the theme of flowers. The flowers come from Altenew along with the sentiment. I colored with Polychromos pencils, two yellows, two greens, two grays and the white for some highlights. I have the tin of 24, and I find for me there are enough colors. Thanks for visiting, and Jeanne I hope you like your card. 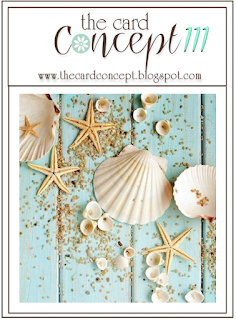 I loved this picture at The Card Concept, and knew it would make a lovely summer birthday card. I used a set from Close to My Heart (Treasured Friendship) and some Stampin up pearls and wood plank embossing folder. I would call my card clean and elegant in styling. I have a card for two challenges to share. 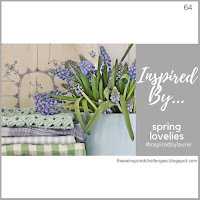 The challenges are Inspired by and Double D.
I broke out a new spring flower set from Altenew - Hyacinths. They are gorgeous though I had a bit of trouble lining them up. I decided to just go with it even if it wasn't perfect. I also used the new purple set of inks from Altenew. My gingham paper is from Papertrey ink, its out of a AS sized package of 9 colors. Thanks so much for visiting. I appreciate that you took the time. Its been a great morning/afternoon catching up on challenges. I have two cards to share. 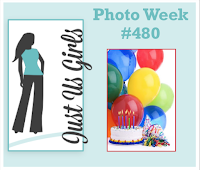 They are going to Twofer - Balloons, Just Us Girls Photo Week, Freshly Made Sketches and Shopping our Stash-Celebrating Friendship. Both cards were made with the smallest Balloon die from a Paper Smooches Balloons set. I cut 15 balloons. Six in red, and the remainder in cool "guy" colors. Here are the two cards together for the Twofer Challenge. One conventional and one unconventional. For the unconventional, the balloons were folded lightly then glued down to make a flower with the balloon knot in the center. I covered it up with a gem. Individually the birthday card will be entered to Just Us Girls and Freshly Made Sketches. And for the challenge at Shopping our Stash - Celebrating Friendship, whats better than giving a good friend a card just because?